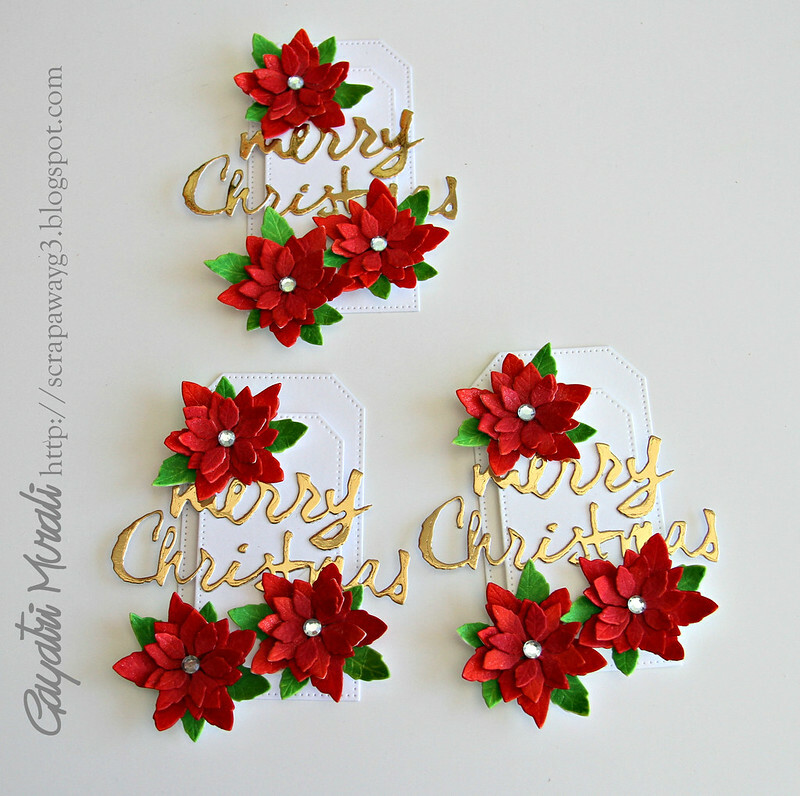 I die cut the Poinsettias and coloured them using copic markers. Colour the diecut while they are still in place. Makes it a whole lot easier. I also used Wink of Stella clear shimmer on them to add some subtle shimmer. I die cut 9 of them, coloured and stacked glued them together with rhinestone in the middle. 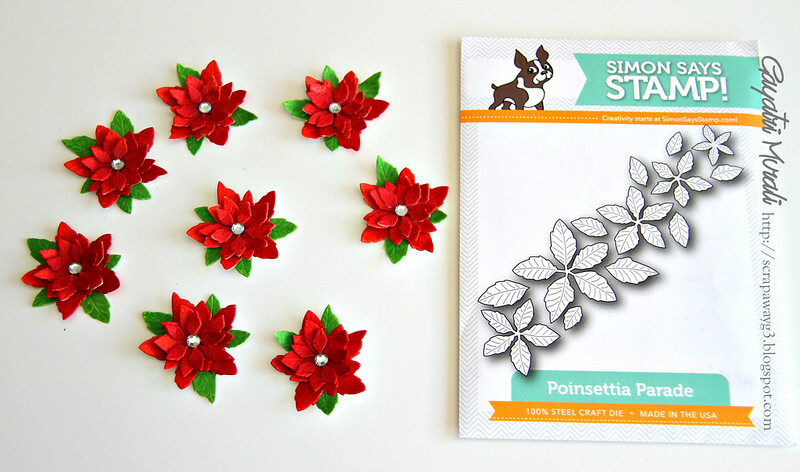 These poinsettias as really beautiful and adorable as they are small. So I need three for one card. 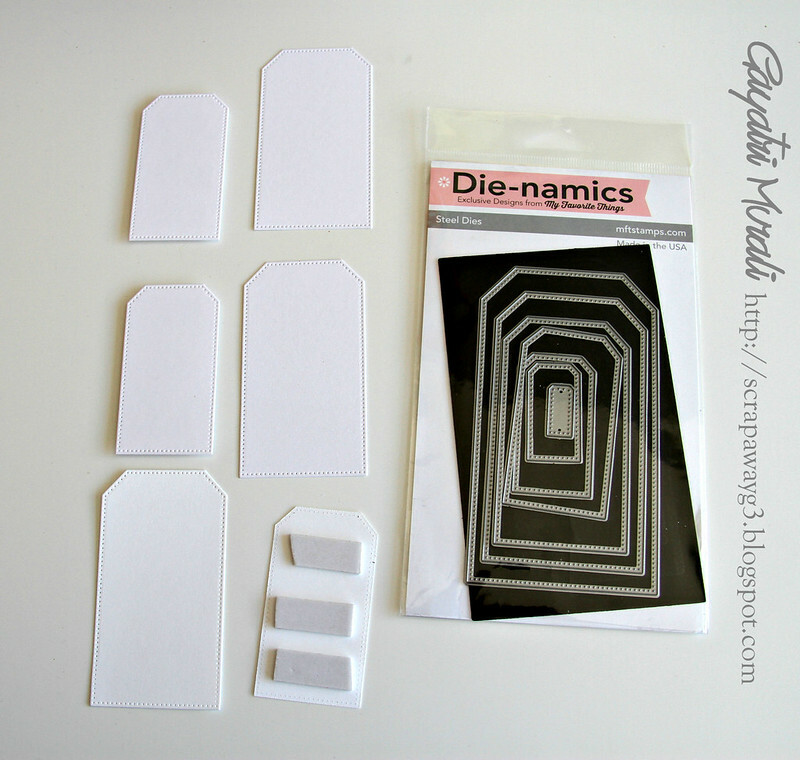 Then I die cut two tags using MFT tag die namics set. I layered the smaller tag over the bigger tag using foam adhesives. The sentiment is also die cut. 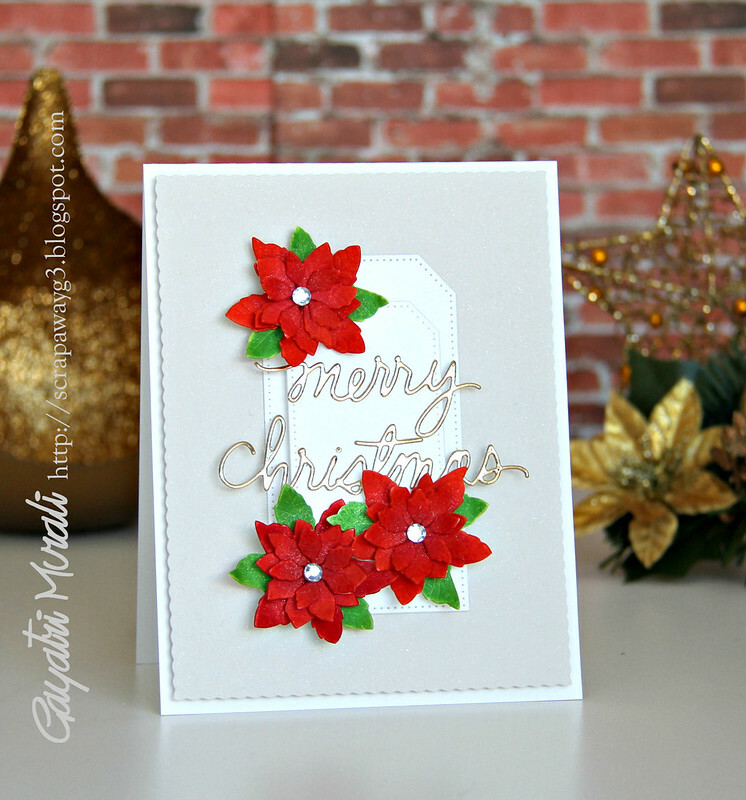 For the first card I used Merry Christmas diecut from Merry & Bright by Essentials By Ellen. But I wanted a diecuts slightly wider. So I used the dies from Papertrey Ink instead for the rest of my cards. 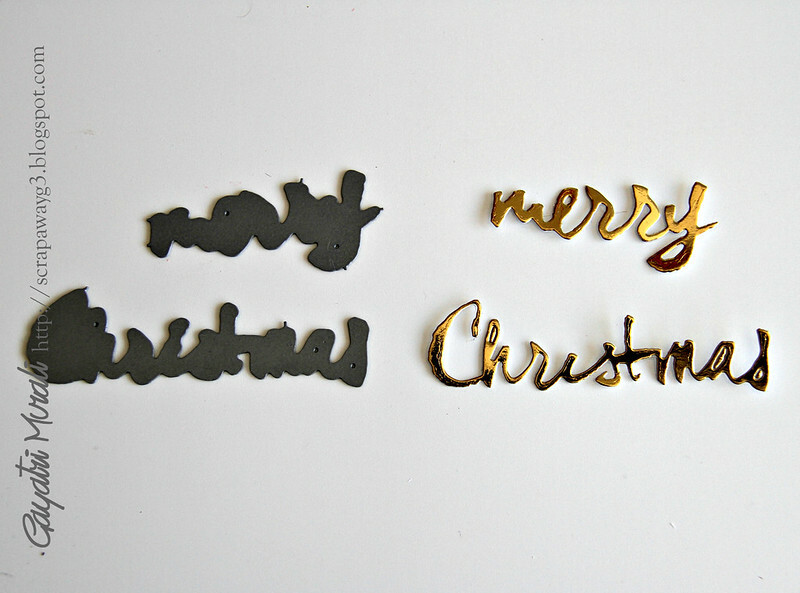 I have diecut using gold foil cardstock. I have prepared the card base using white card stock. The panel is Grout Grey cardstock from My Favorite Things. I have trimmed using my new American Craft paper trimmer which has the tiny scallop blade. 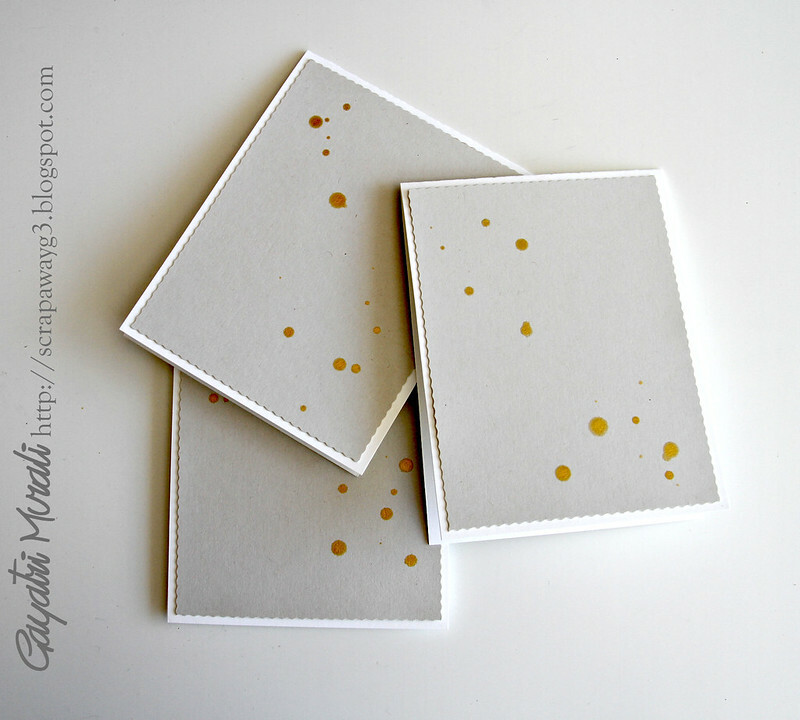 I then sprayed the panels with Tsukineko’s Sparkle shimmer and spattered with gold colour shine from Heidi Swapp. Now thats what I am talking about jazzing up the cards. The tags are now layered with the sentiment and flowers. They are then glued to the card front at the centre using adhesive tape. Here are the three finished cards. 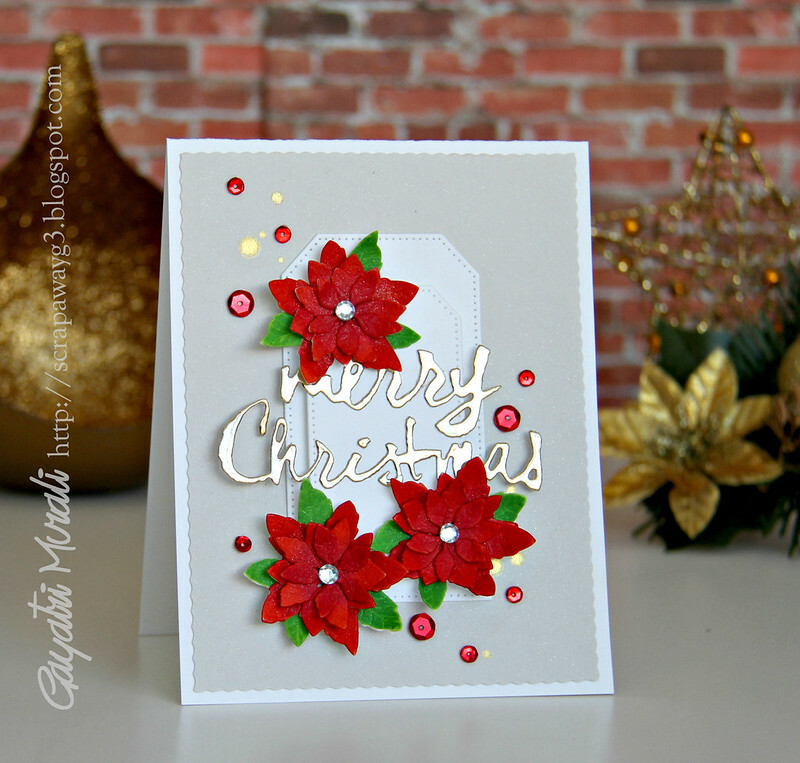 For this card I added some green 6mm and 4mm sequins from Classic Christmas Collection from Pretty Pink Posh. For the next card, I added some red baker’s twine and gold 6mm and 4mm sequins from Pretty Pink Posh. 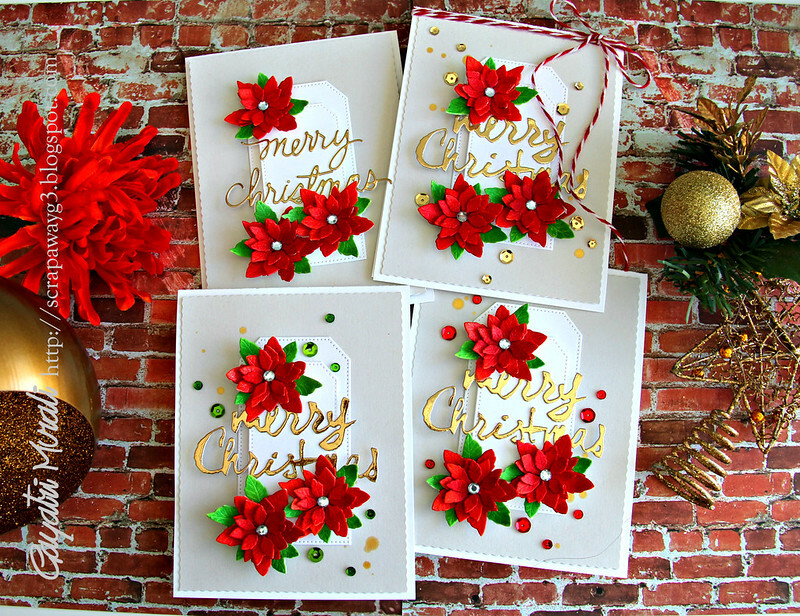 For the last card, I added some red 6mm and 4mm sequins from Classic Christmas Collection from Pretty Pink Posh. Here are all four cards. Hope you are inspired by this set. Next weekend card set will be my final set for the year. Don’t forget to follow my Christmas Card gallery on Pinterest. WOW! These are gorgeous, Gayatri! You ROCK!!! Truly lovely. They're festive and colorful. Gorgeous design. This really has been a terrific series. Wow, Gayatri, these cards are da bomb!! I love each and every one of them! 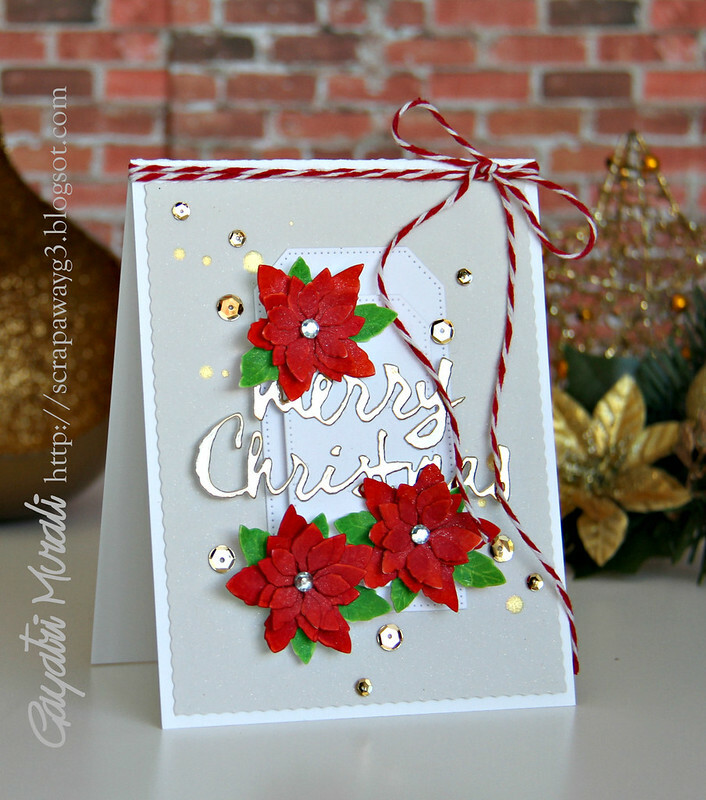 Gayatri gorgeous cards, thamks for the step by step! I love these poinsietta cards. I like the green-sequined one the best. Oh my gosh!!!! This is amazing and then you took the time to give all the wonderful steps you took to make this. Its gorgeous! I was expecting like 100 comments! 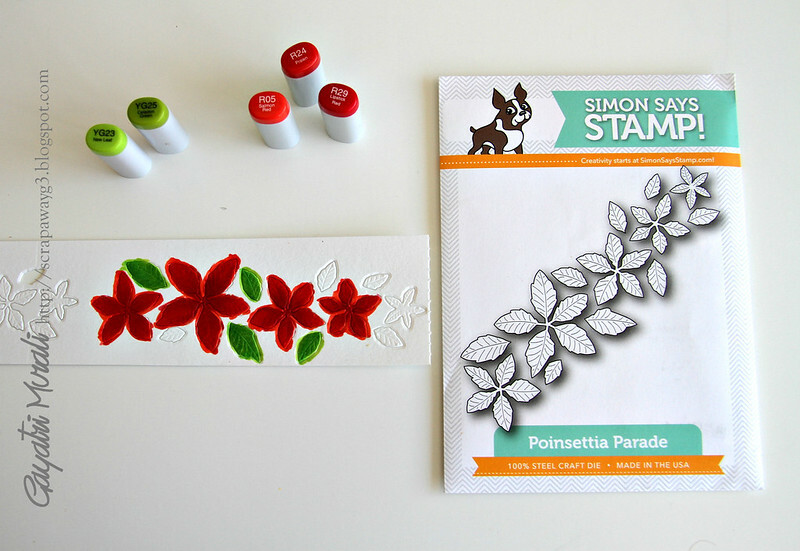 I love the idea of coloring the cuts while still in place, great tip! Thanks Gayatri!